You’d be hard pressed to surpass Waimea Bay as a setting for receiving one of the most prestigious awards that a waterman could receive. Over ten years ago, waterman Kalani Vierra received the Quiksilver Waterman of the Year Award, and since that time, he hasn’t stopped excelling in all that he attempts! In 2004, during the Quiksilver, in Memory of Eddie Aikau, he was handed this accolade during the opening ceremony, along with most of his peers in surfing and lifesaving. This is just one of his many accomplishments! After 10 years, I’m still in shock! It’s probably one of the best things that has ever happened to me, and what an honor! I still can’t believe it!” he responded, when asked what receiving the award meant to him. “To me, Eddie Aikau and Duke Kahanamoku are my idols, all because of what they have done as ambassadors of aloha and as lifesavers.” When asked whether it has changed his life, he remarked, “It definitely helped promote my career personally, and professionally, it resulted with personal respect and sponsorship support.” OHANA This champion surfer, one, six and sailing canoe paddler, who has been surfing for more than thirty five years, now resides in Poipu, on the Garden Island. He lives there with his wife Tracy and two daughters, Eliza Vierra and Kaleigh Rutt. He grew up on the south and west side of the island, and loves his tight knit community, with its beautiful, uncrowded beaches. 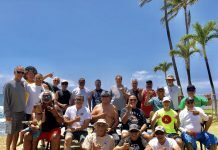 The Hawaiian waterman has been fortunate enough to have made a living in the water, and is the Operation Chief of the Kauai Fire Department, Ocean Safety Bureau, as well. His name graces the final results of so many events and races. This list includes the love of SUP (Stand Up Paddle), surf and distance paddling, longboard and short board surfing, outrigger paddling with OC1 and OC6, and hitting the outer reefs. The complete waterman has crossed one of the most challenging bodies of water, the Kaiwi Channel (between Moloka’i and Oahu). “I’ve crossed the Molokai channel twelve times on different vessels, and have even received some top honors in a few different divisions. Back on the shores of Kauai, he fills his days with his work. “I am the director of the County of Kauai Keiki/Jr. Lifeguard Program, and we service and train over four hundred fifty keiki a year, ages 8 to 17 years old. 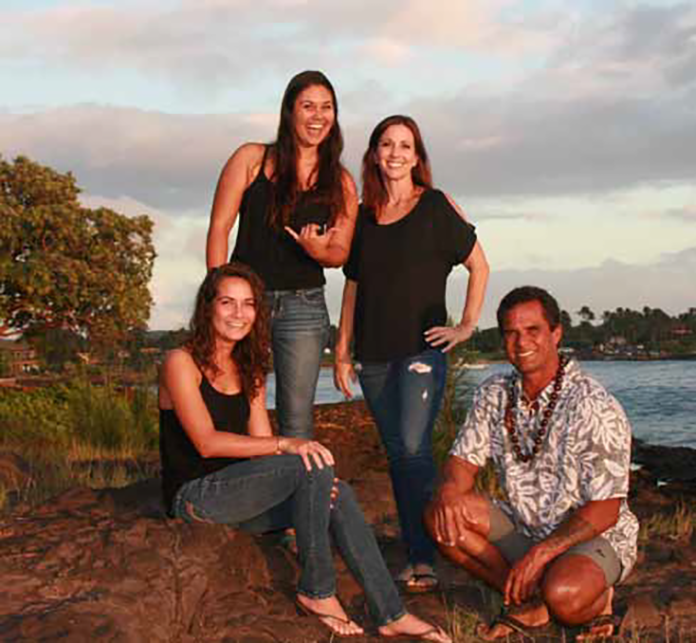 We teach ocean safety awareness, CPR (Cardio Pulmonary Resuscitation), first aid, rescues, drug awareness, and team building.” He takes pride in the fact that his keiki have won the state championships for twelve consecutive years. To compete at such a high level of expertise, Vierra does his ‘land workout’ with Cross-Fit, weight training, yoga, running, biking, hiking, hunting, horseback riding, and camping. “I also assist in taking care of our horses, which my wife and daughters enjoy, for both rodeo and trail rides.” When asked how it compared to water sports, he remarked, “Its similarities are that it takes physical endurance, strength, and flexibility, and it keeps you spiritually balanced in life.” He hits the Cross-Fit three times weekly, and works with a gymnastic coach prior to competitions. 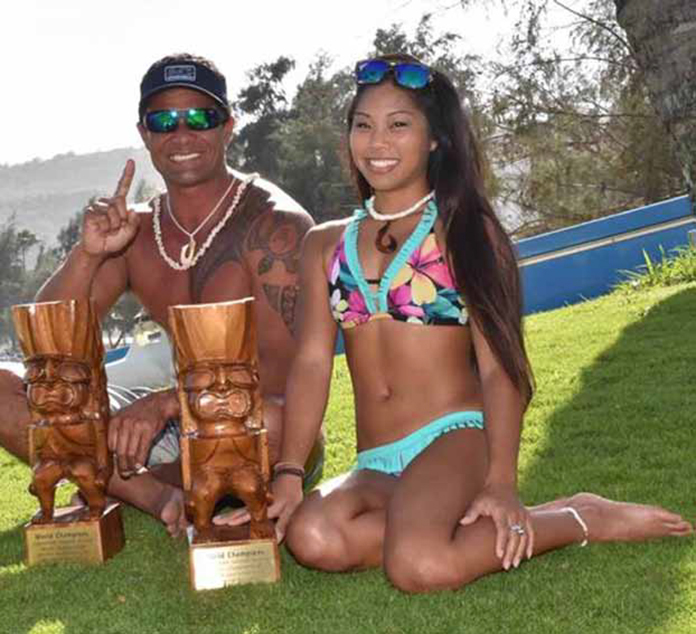 Recently, Vierra and tandem surfing partner Krystl Apeles, won the Tandem Championship at Makaha. He has won four other world tandem titles, two in 2007, and one each in 2008 and 2009. The first victory was with partner Blanch Yoshida in 2007, and then with his daughter, Eliza Vierra, in 2008 and 2009. “It’s unique! Lots of people have never seen tandem surfing before. When they do, they are blown away! Tandem surfing all started here in Hawaii. The ancient Hawaiians surfed tandem, as well as in modern times. In the early 1900’s, with Duke Kahanamoku, the Waikiki Beach Boys took tandem to the ‘next level’ by performing different lifts with their guests. Vierra commented, “It is certainly much more challenging than surfing by yourself! With his continued passion and expertise, this sponsorship will surely be realized! With style and grace, she poses as though she is doing ballet in the air. She floats along, gliding on a wave, all the while suspended above her surf partner. Tandem surfer, Krystl Apeles, glides while climbing atop her tandem surfing partner Kalani Vierra (story pg. 7), with winning form. This stylish pair are the 2015 Tandem World Champions, and they are on a roll! 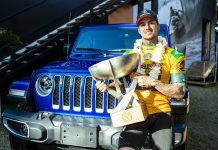 In the recent past, they have entered five competitions, winning three of them, most recently, the World Championships at Makaha Surfing Beach this past December! When witness to their winning style, one assumes that this Anahola native is constantly at the beach, surfing with her Fire Rescue Partner. However, this Kauai High graduate completed a Bachelor of Arts from the University of Hawaii, in Apparel Product Design and Merchandise. She is currently the owner of Puka Surf Company, a costume designer and dancer for Halau Hula O’ Leilani, and the Manager/Brand Developer of Executive True Blue, Inc. (dba Kauai Beach Boys, Island Adventures, and Da Life Outdoor Gear). She added, “Family is what shapes you, and I feel blessed to have their guidance, love, and support.” Her family has shaped her into a champion! While Apeles enjoys long boarding, free diving/spearfishing, and mermaiding for shells in the water, Tandem Partner Vierra has also involved her by introducing her to the Make-A-Wish Foundation for the first time. Surfing has evolved into a worldwide respected sport and the same is happening for tandem surfing. Duke Kahanamoku was a surfing ambassador of Aloha in the 1920s. He shared his love and respect for the ocean, while connecting with people around the world. Tandem surfing has been practiced in Hawaii long before Duke, but he took tourists out surfing on his board in Waikiki, and soon the Beach Boys followed suit. They challenged each other in doing differ-ent poses and lifts. When tandem surfing made its way to Muscle Beach, California, the difficulty evolved to an acrobatic level. The International Tandem Surfing Association (ITSA) held its first sanctioned World Championship in 2006. This provided tandem surfing an arena to perform, as well as to successfully blend the newly evolved expectations of both surf and acrobatics. Tandem surfing is just as enjoyable to watch as surfing, because it combines the strength and agility of surfing with the balance and artistry of acrobatics. The sport of tandem surfing easily captivates a wide audience because it is so dynamic. She added, “I hope this recent win helps us to secure some financial sponsors that will give us the ability to do what we do on a higher level. I would utilize the financial support to push the limits of the sport, to promote surfing and tandem surfing world-wide, to be involved in the community and non-profit organizations, and definitely to inspire others to reach for their dreams.” We certainly hope that this happens too! Continue the Aloha!